Is It Dangerous to Have Your Heart Rate at 170 When Running at Age 50? Your heart rate while exercising is an indicator of the level of intensity and effort you are putting into the ongoing activity. A high heart rate verging on the maximum does present more risks and could be considered dangerous depending on a variety of factors. 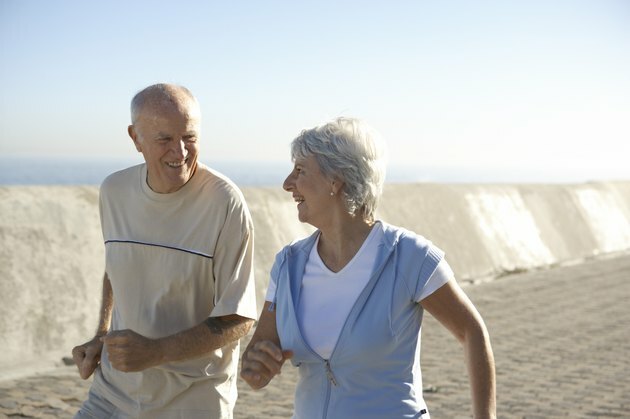 These include exercise tolerance, age, health and medical history. Always consult a doctor before trying a new exercise intensity or regimen. The long-established equation for establishing maximum heart rate while exercising is to subtract your age from 220. For example, a 50-year-old man's maximum heart rate is 170. Research by Northwestern Medicine in Chicago indicates a new formula is more appropriate for calculating a woman's maximum heart rate. The formula is: subtract 88 percent of your age from 206. That gives a 50-year-old woman a maximum heart rate of 166. To improve your cardiovascular fitness by running, keep your heart rate between 65 and 80 percent of your maximum heart rate. This gives a 50-year-old man a target heart rate of 110 to 136. A 50-year-old woman should have a target hear rate of 108 to 133. Exercising at a very high intensity, at a heart rate above 85 percent of maximum, increases your risk of cardiac events or heart problems, according to a 2002 study published in the Canadian Medical Association Journal. According to this criteria, if you are a 50-year-old person maintaining a heart rate of 170 while running, you raise your risk for cardiac problems. The risks are further increased if you have a history of heart disease, high blood pressure or diabetes, or if you use medication such as beta blockers. There are doubts whether the 220 minus your age method of calculating your maximum heart rate is appropriate for older adults, according to a 2001 study published in the Journal of the American Journal of Cardiology. Lead study author H. Tanaka suggests an alternative equation: 208 minus your age multiplied by 0.7. This gives a 50-year-old person a maximum heart rate of 173. Whatever formula you might favor, seek the advice of your doctor before you start an exercise program and monitor your heart rate when running. What Is the Ideal Blood Pressure for a 48-Year-Old Male?